New contest: Name that location of the RTG! That Godley "let's taze a guy at city hall" case just got crazier. There was a plea bargain on the table for the BS charge of Resisting Arrest but the prosecutor has now "withdrawn" it and set the case for trial. (It sounds like the the defendant finally came to his senses and wouldn't take a plea bargain of probation and the prosecutor got pissy.) Why set it for trial? Why not dismiss it? That case cannot be won. There is no way the prosecutor has looked up Resisting Arrest in the Penal Code and knows what he has to prove. And to think his job is not to convict but to see that "justice is done". I had my "mind blown" last night when I discovered that in one of my favorite movies, Little Miss Sunshine, that Breaking Bad stars of Bryan Cranston (Walter White) and Dean Norris (Agent Hank Schrader) both make appearances. Here's a quick vine of their characters. I finally found the dumbest prosecutor in Texas: District Attorney Stephen Tyler down in Victoria County. He has a "policy" of taking every DWI case to trial and refuses to make any plea bargain even when the defendant wishes to plead guilty. The judges over those cases (I'm assuming they think he is an idiot as well since the policy would crush the docket and cost the county a fortune) went ahead and accepted guilty pleas and imposed sentences without the DA's consent. The judges publicly said that the DA's policy is "nothing more than a sham and a display of pageantry." The DA actually appealed (insert my: "Too many prosecutors" line here as well as the viral video star Sweet Brown's line of, "Ain't nobody got time for that!) An appellate court said, after struggling with some pretty good defense arguments, that a judge cannot legally accept a plea of guilty without the prosecutor's consent. The story, and the opinion, is here. It's a must read for some legal folks. Trump fell out of the lead in the polls but this morning an updated poll shows he is back at the top. Trump! Did you know that the day after Roe v. Wade was decided it wasn't the top headline on the New York Times? Why you ask? LBJ had died. And I had no idea he was only 64 when he died. Every proposition on the Texas state wide ballot passed. Doesn't that almost always happen? Plus, how can you be against lower taxes (Prop 1) and non-toll roll funding (Prop 7)? In Houston, a proposition that would "have banned discrimination based on sexual orientation and gender identity "was voted down. Our Lt. Governor Dan Patrick tweeted, "On the defeat of Houston Prop 1 ..... Men, stay out of women’s locker rooms and restrooms." That's kind of dumbing down the issue. Hey, Dennis Prager fan: During the same segment I mentioned yesterday, a caller said that the fear of the oceans rising due to global warming is false because when ice melts in a glass of water the level of the water in the glass doesn't rise. Prager said he didn't know if the theory was right but quickly got excited and said that was a very interesting theory! He then said his wife (third wife, by the way) immediately texted him to tell him there is a huge flaw to the analogy (duh), and he admitted the two were not comparable. Sports: I was wrong about Baylor being out of the top 4 for the first playoff rankings. I said #5 and the are #6. But, man there is about to be some fun in the Big 12: Oklahoma, Oklahoma State, TCU and Baylor all have to play each other. Throw in the possibility of an upset of one of those teams by someone else, and I'm not sure any of them get through the schedule unscathed. Police are urging a boycott of Quentin Tarantino's upcoming movie after he made some comments about police brutality. I have no problem with that. That is their right. I do have a problem with them making these statements while on duty while being paid by the taxpayer. Do it on your own time. Mrs. LL is always playing video games on her phone as does almost everyone else I know does. Get this: Video game maker Activision will buy the company that made 'Candy Crush' $5.9 billion. 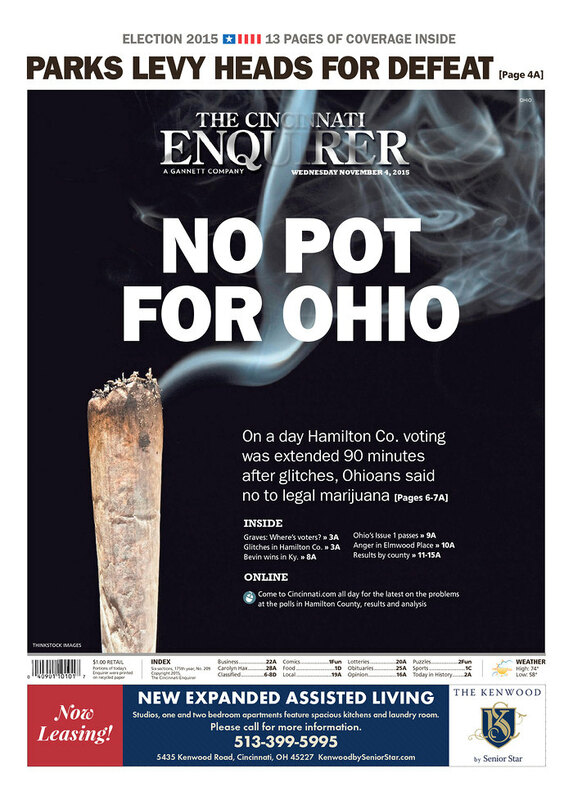 Ohio voters refused to legalize recreational marijuana. Mark Davis tweeted: "Thank God. #Ohio voters see idiocy of legal pot 65-35. Imperfect R vs D model, but the weed vote was all Democrat. Ohio winnable in '16." Ummmkay. I called Grace Kelly the most beautiful woman in the history of ever. Here's a picture proving me right from 1954.